What comes to mind when you hear “autonomous driving”? Some of you may think of a car that drives safely on its own, while others may think of a car that stops automatically when detecting danger. Each of you probably have different impressions and understandings. Autonomous driving is a technology that realizes the various decision-making and operations that has usually been done by a driver. It utilizes a sensing function with several cameras mounted on a car in collaboration with a controlling system for accelerating and braking. There are broad ranging levels of autonomous driving, including driving assistance technology that has already been practically implemented in the market, as well as fully autonomous driving that does not require a driver. Plans are being developed through the cooperation of the government and private sectors toward the actualization of a fully autonomous driving. Going forward, there will be several steps until its realization, including the use of AI to connect cars with sophisticated, data-oriented roads and infrastructures. We see several types of cars with autonomous driving functions on the streets today, like cars that detect obstacles and stop; cars that keep a set distance away from cars in front; and cars that accurately park on their own while checking for obstacles. People drive using their eyes, head, arms, and legs. But, in autonomous driving, the functions and decisions made with one’s eyes, head, arms, and legs are carried out by an automatic driving system equipped on the car. Below, we will introduce the functions of autonomous driving, divided into functions of the eyes, head, as well as arms and legs. Imagine you are driving and suddenly a kid walking his dog jumps out into the street and the car in front grinds to a halt without notice. Events like these cannot always be avoided just by using human perception and reaction, but autonomous driving can instantly detect danger and help avoid them on your behalf. The autonomous driving system has numerous high-performance cameras, sensors, and radars that function like your eyes, with constant 360-degree sensing around the car. It also helps guide you to your destination via the best route by using a communication system to know the road situation far ahead of your view (i.e. traffic congestion, accidents, resting areas, etc.). Information captured by machines is only a collection of the phenomena in front. What’s necessary is the ability to properly identify the captured information and determine whether it’s an obstacle. The autonomous driving system makes an instant decision of whether to stop, turn, or accelerate based on the identified information. After seeing (capturing the phenomenon) and thinking (decision-making), the autonomous driving system controls the car such as changing the direction of the tires, adjusting the number of rotations of the engine, and avoiding obstacles to their right or left. It can also control the steering wheel and brakes to slowly drive around the obstacles in front when judging that they can be passed safely. It controls the movements smoothly, almost as if a human being is operating the steering wheel, accelerator, and brake. Next, we will touch a little upon the future of autonomous driving. The government has announced that it has set driving without human intervention as one of the future goals of autonomous driving. Specifically, it aims to realize the transportation of passengers to a destination by autonomous operation of cars through several stages. The evolution of this system and the implementation of a fully autonomous driving may solve problems faced in the past, like worries about kids playing pranks in the car or fears of being late to an important business negotiation due to traffic. In the future not so far from today, we may be able to enjoy a cup of tea while waiting for the car switched to fully autonomous driving to reach the destination. And the monitor will display all kinds of information like reward points of nearby shopping malls and parking lot availability status, based on information from roads and railings embedded with sensing chips. Hitachi is carrying out further development of technologies supporting autonomous driving according to the following four pillars: safety—no collision with people and things and no slipping; comfort—stress-free driving with good ride quality; fuel efficiency—reduced environmental load; and time—quickly reaching the destination. 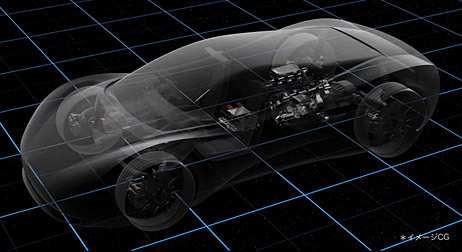 Hitachi Automotive Systems strives to realize a safer, more comfortable, and environmentally friendly car society. 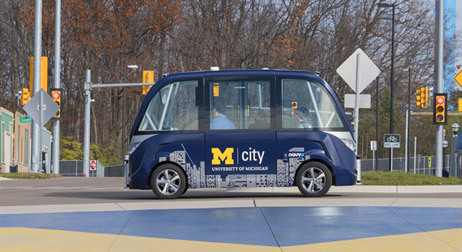 We started test runs of driverless cars and connected cars at Mcity, a testing facility in North America built to simulate real-life situations in urban areas.